CCE or LFA 1. If a certain number of issues are raised (3 or more), it is likely that a CCE is needed. 2. If legal custody and parenting time recommendations. 1 CCE or LFA 1. If a certain number of issues are raised (3 or more), it is likely that a CCE is needed. 2. If legal custody and parenting time recommendations are requested, it is a CCE. 3. Relocation being a more complicated matter is a CCE. 4. 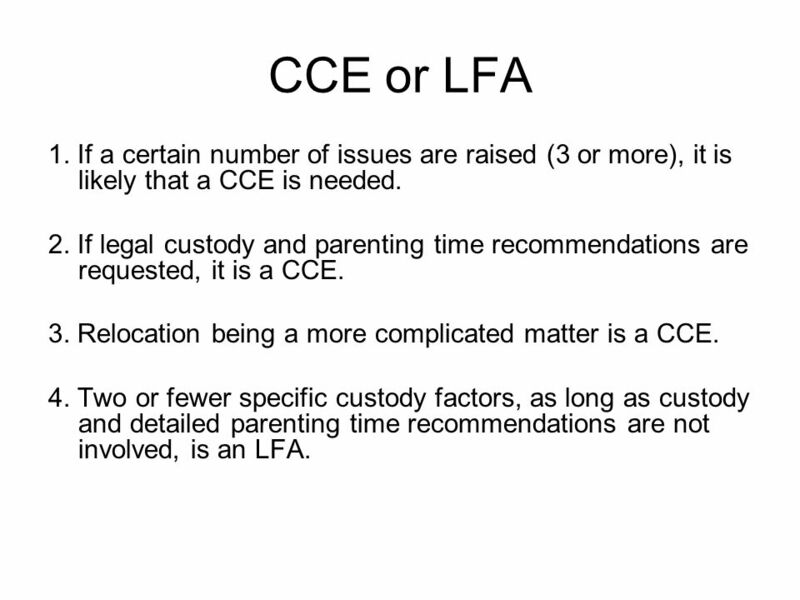 Two or fewer specific custody factors, as long as custody and detailed parenting time recommendations are not involved, is an LFA. 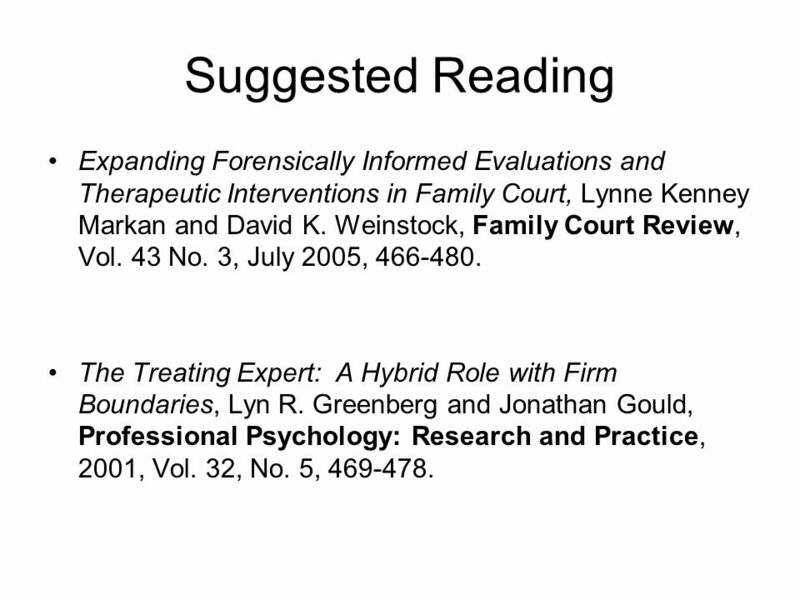 2 Suggested Reading Expanding Forensically Informed Evaluations and Therapeutic Interventions in Family Court, Lynne Kenney Markan and David K. Weinstock, Family Court Review, Vol. 43 No. 3, July 2005, 466-480. The Treating Expert: A Hybrid Role with Firm Boundaries, Lyn R. Greenberg and Jonathan Gould, Professional Psychology: Research and Practice, 2001, Vol. 32, No. 5, 469-478. 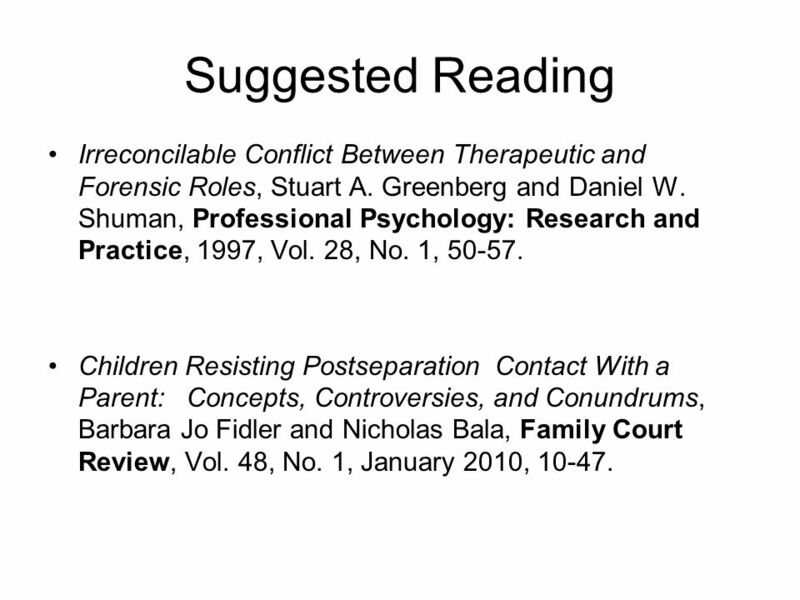 3 Suggested Reading Irreconcilable Conflict Between Therapeutic and Forensic Roles, Stuart A. Greenberg and Daniel W. Shuman, Professional Psychology: Research and Practice, 1997, Vol. 28, No. 1, 50-57. 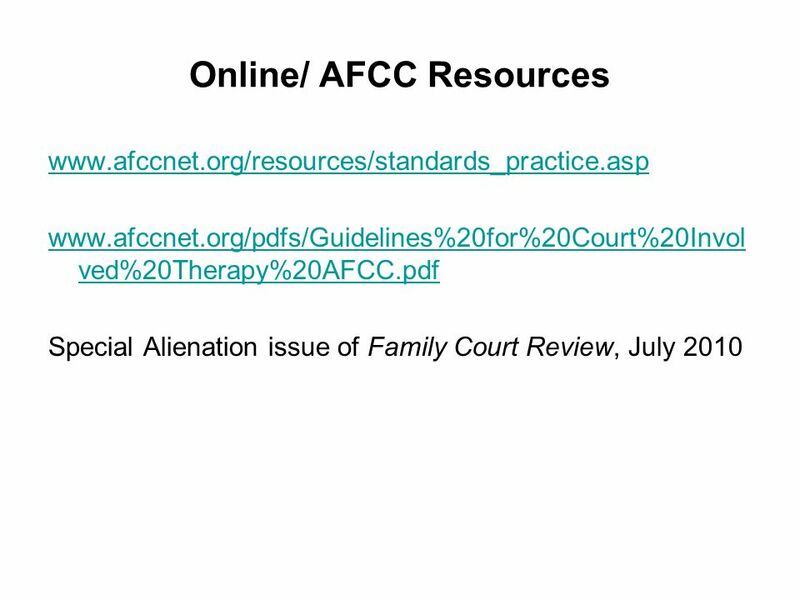 Children Resisting Postseparation Contact With a Parent: Concepts, Controversies, and Conundrums, Barbara Jo Fidler and Nicholas Bala, Family Court Review, Vol. 48, No. 1, January 2010, 10-47. Download ppt "CCE or LFA 1. If a certain number of issues are raised (3 or more), it is likely that a CCE is needed. 2. If legal custody and parenting time recommendations." Early Childhood Trauma-Informed Practices: Building a Common Framework for Community Providers H. Jane Sites, LSW, Ed. D. Cincinnati Children’s Hospital. Risk Management for Psychologist Parenting Coordinators Matthew J. Sullivan, Ph.D. APA, 2008. Copyright © 2002 Pearson Education, Inc. Slide 9-1. New frontier s e r v i c e s TEAMWORK. 2 new frontier s e r v i c e s TABLE OF CONTENTS 1.HOW TO ESTABLISH A TEAM 2.HOW TO CHOOSE THE TEAM MEMBERS 3.LEADERSHIP. Rick Hood Royal Holloway University of London. Background Models of integration Research findings Perspectives on complexity Implications for practice. © KeelyKolmes, Psy.D. and Dan Taube, J.D., Ph.D. Findings on Therapist-Client Interactions on the Internet: Boundary Considerations in Cyberspace Keely. Organizing Schools for Improvement: Lessons from Chicago Presented by: Anthony S. Bryk, Penny Bender Sebring, Elaine Allensworth and Stuart Luppescu Gleacher. Cradle to College and Career Practice Group Part of the National Community of Practice on Transition IDEA Partnership.